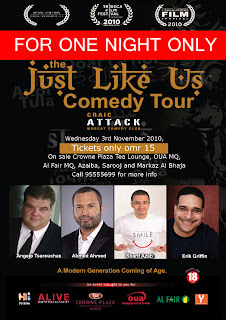 The ever-popular Craic Attack group is bringing Egyption born (but raised in America) comedian Ahmed Ahmed is bringing his Just Like Us tour to Muscat this Wednesday night. Tickets cost RO 15 and available from all the usual outlets from today! Isn't there another comedy night this Wednesday @ the Rugby club also??? This is exciting..!! Can't wait..! !